HorseTips.com.au has been created as a service to aid Professional Punters in improving their Punting. Horse Tips – Australian Horse Racing Tips, in conjuction with HarnessTips.com.au and GreyhoundTips.com.au provide Australian Horse Racing Tips in the form of the top eight horse racing tips and runners in each race. Our selections are all based on a statistical formula that we have developed over many years of testing which we apply to every runner in the horse race. This enables us to provide a reliable consistent analysis of every horse race, every runner, every time. When selecting our Horse Racing Tips, we use every bit of Form data available such as the horse weight, last three starts, ratings and all other Form data we can obtain. This information is then tested against hundreds of past Horse Races which then provides us with a certain percentage weighting through which to base our current assessment. The acquired weighting is the applied to the current runners which in-turn provides us with our Australian Horse Racing Tips. 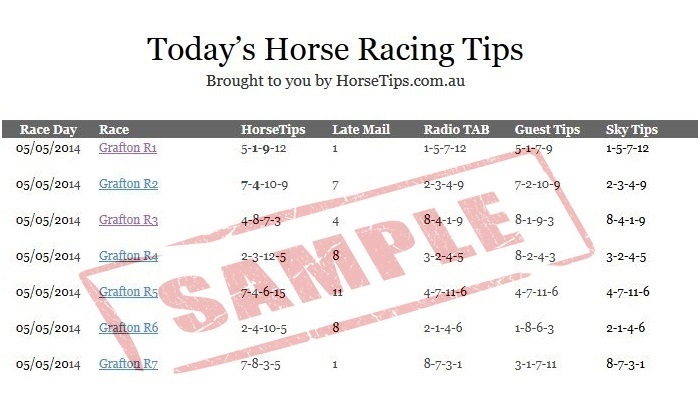 Horse Tips – Australian Horse Racing Tips has not been created as a service that will pick the winner every time, but instead, provides a service that enables our Professional Punters to access reliable, consistent Horse Racing Tips for nearly every Australian Race Meeting for Horse, Harness and Greyhound Races every day. If you are interested in Harness Racing please visit our Harness Racing Tips website, or if you prefer Greyhound Racing please also visit our Greyhound Racing Tips website. Thank you for visiting Horse Tips and we hope to see you as a regular subscriber soon.